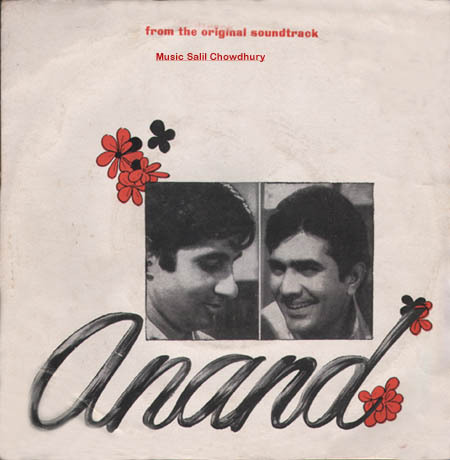 The title music of 'Anand' is based on a wonderful Bengali song by Shyamal Mitra - 'Ogo Surangana' first performed for the All India Radio but never released commercially, which is a shame. The only satisfaction is that Salil did create an excellent version of this song ("prema virinchiya") in the Kannada Film 'Samsayaphala' and the song was released in an album. Interesting facts about the songs - there seems to be an un-recorded antara for the song "zindagi kaisi hai paheli haay" which Manna Dey sings often in concerts. In the film this song has two and not the unrecorded antara. In the record, of course, there are only two antaras. I have no idea why the third antara was never included in the film. However, recently Prasar Bharati had released a a video of a live performance by Manna Dey, singing this song with the new antara ! Listen to "zindagi kaisi hai paheli" with the new antara. "maine tere liye" was also originally recorded with three antaras but in the film and in the record there are only two antaras. Someone very kindly sent me the three antara version - but I have no idea where he got it from and why it was dropped from the film. Recently (2009), Lata Mangeshkar paid tribute to Mukesh and Salilda by recording "kahin door jab din dhak jaaye" . I found the arrangement nearly perect but not 100% . Some of chords sounded different. Lata's singing was excellent. However, I still prefer the original by Mukesh.